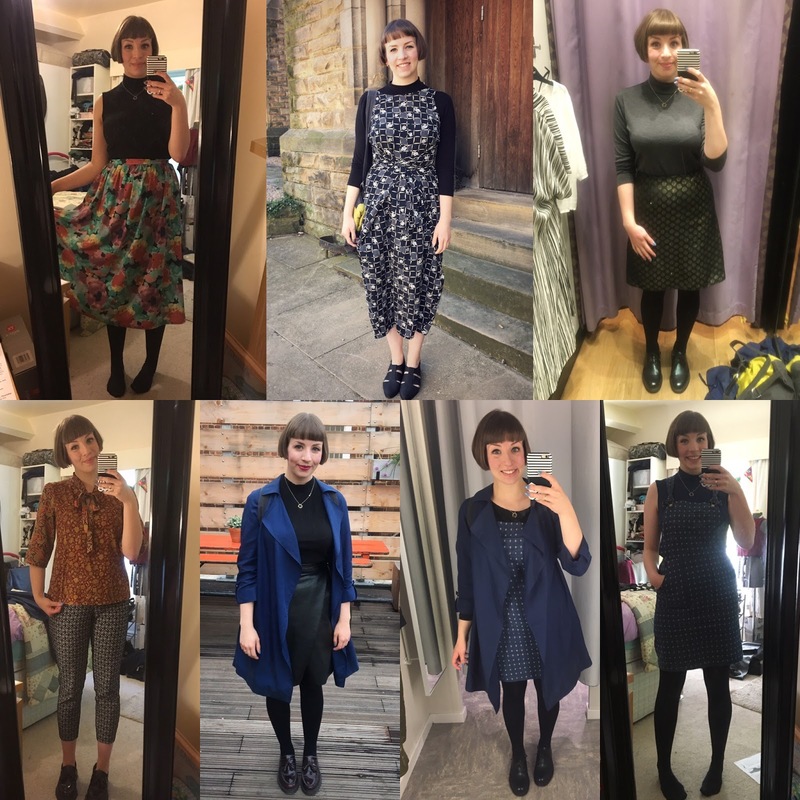 Day 15 - Self drafted Liberty dress; Day 16 - Vogue 1395; Day 17 - Blue Kielo Wrap Dress; Day 18 - Faux wrap skirt; Day 19 - Nita Wrap Skirt and sleeveless rise turtleneck hack; Day 20 - Simplicity 2154 skirt; Day 21 - (pictured below at The Big Simplicity Blog Meet) B6178 culottes, sleeveless Rise Turtleneck and Driftless Cardigan. Days 30 and 31 came from my holiday in Barcelona, and featured my recently blogged B6178 culottes, the wrap top I made as a part of my 'make more tops pledge', and my yet-to-be-blogged second pair of Turia dungarees - those of you who follow me on Instagram may have seen them over there! - My style's definitely evolved. 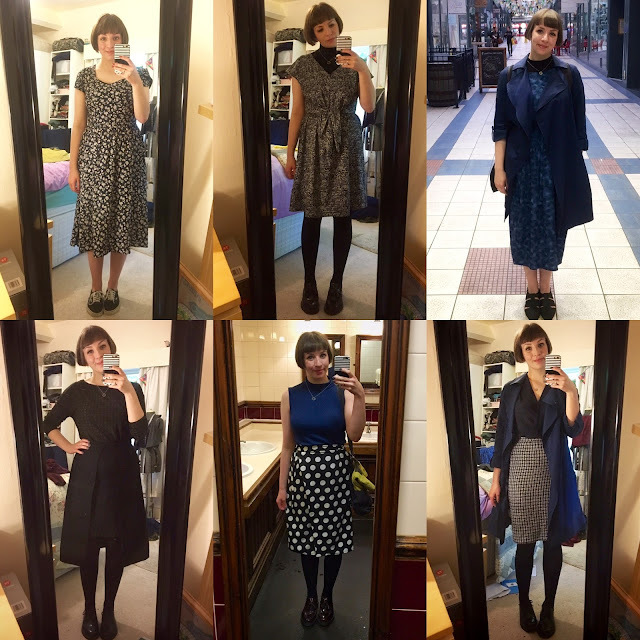 I can split my me made wardrobe into Before-Kielo Wrap Dress and After-Kielo Wrap Dress. Making my first Kielo last year really marked a shift in my me made style, and it's the After's that definitely get a lot more wear. - I'm moving house soon and have to do the brutal wardrobe cull, so Me Made May has really helped with some difficult decisions. My V1395 dress (pictured on day 16 above) is getting recycled - I just don't get on with the fit - along with a bunch of older makes that never got a look in during the May. - You know those days where you just don't feel like getting dressed? Well I haven't got any comfy me mades to wear on them. I'm not sure if this will spur me on in making a bunch of 'house clothes' but I'll definitely consider getting some PJ bottoms sewn up. - I LOVED seeing everyone else's makes. My Instagram feed was so vibrant and positive all month - so much talent and beautiful patterns and fabric that I'm now dying to try out. It wouldn't be the same if MMMay ran all year round, but there's a part of me that wishes it would - thanks Zoe for organising once again. The Big Simplicity Blog Meet! And now a little about The Big Simplicity Blog Meet, which was held in Manchester a few weeks back. Myself, Aimee of Wrong Doll and Angela of Looks Like I Made It had already arranged to meet up in Manchester, and by great chance (fate?!) the event was running on the same day, so we signed right up! Angela, Aimee and me - so lovely to finally meet! Anyway, here May is, showing us all how to sew the neatest and quickest invisible zip of all time. I ran straight out to Abakhan after and bought a skinny piping/zipper foot - the piece of kit I'm missing that's prevented me getting an up close finish on the bottom of my zips for all these years! We were lucky enough to get a fab bag of patterns, goodies and reading material at the end of the day too. I also grabbed some ridiculous but wonderful snake skin effect faux leather from Abakhan too (May recommended Scotch tape of the machine foot for sewing faux leather!). 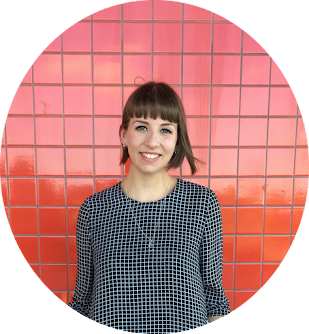 For a much more comprehensive run down of May's brilliant tips and advice, see Aimee and Angela's great round ups of the day. Thanks Simplicity for hosting such a wonderful event!